This beautiful house in Penzing is very nicely decorated and there is an excellent starting point for discovering this tourist region of Vienna Lower Austria and Burgenland. The house is located on the main road. The house is located just outside Vienna SOUTH FACING, and it is very bright. Living area approx 120m²; Living room with dining area, 3 bedrooms with walk-in closet, bathroom, toilet, kitchen, terrace. Attention no parking on the property but only on the street in public, in front of the house! Location: Right next to the station that you are comfortable in every 15 minutes after Hütteldorf brings. 3km from the house there is a Park and Ride garage. There you can park your car (cost around EUR 4 for all day parking) and conveniently take the subway to the Opera in 20 minutes. Enjoy your family and the beautiful house just outside Vienna. The house is located on the western outskirts of Vienna just off the road to Vienna. The S-Bahn and the bus stop outside the front door, and offering easy access to every 15 minutes in the city center of Vienna. Follow in the footsteps of the Habsburg monarchy of yore, visit the splendid baroque Schönbrunn and Belvedere palaces, take in the Hofburg a look at the nerve center of the former giant empire and take a walk on the magnificent Ringstrasse. They belong to Vienna as St. Stephen's Cathedral and the Riesendrad: the cab. A ride on one of the two-horse carriages part of the culmination of many tourists. A cozier way to explore the beauty of Vienna, there is almost no. Art Nouveau: Visit Klimt and Schiele at the sites of their activity. 'To every age its art - the art its freedom.' It stands above the portal of the Secession, one of the most famous buildings of the Viennese Jugendstil to 1900's. There are several taverns and many restaurants in the area. An outdoor swimming pool (from 1 to 5. 30. 9. open). Vienna has to be seen !!! The beautifully furnished house with 100sqm of living space you can enjoy (without owner) alone. The house consists of a 35sqm living room with access to the terrace. There, the kitchen with electric stove, sink, refrigerator, coffee maker, and complete crockery and cooking equipment. The bathroom, toilet, all centrally heated. More, there are 3 bedrooms upstairs. Sheets and towels are provided and are included in the price. Low noise. Pets Allowed! Free parking is available in front of the house Languages: English, German. Golf: The 9-hole course of the GC Wienerwald is located in the most beautiful area of ​​the Vienna Woods, between Laaben and Klausen-Leopoldsdorf. In 2008, the GC Wienerwald was acquired by Murhof group and at the end of the year were the greens and tees rebuilt, the wear anything under the consideration of the strict regulations of a conservation area statement. If you place it on a quiet round of golf in a scenic location, value and have nothing against natural fairways, try it! Ski: We also have a house in a ski resort (Hochkar 150km away from Vienna) that we rent. Ask for it, a combined HOLIDAY IS POSSIBLE! With a capacity of 16 000 persons per hour transport you Hochkar 9 modern lifts and railways from the lower station (1380m) at an altitude of 1800 m. This means minimum waiting times and maximum skiing pleasure! For bookings less than 6 DAYS we charge a fee of € 40.- This is to be paid upon arrival. Ample free parking in front of the house. I would be very glad to see you with us to welcome! After staying here for nearly a month, I am so impressed with everything. It is immaculate, huge, and convenient. The Wien Hadersdorf S-Bahn is a 3 minute walk, 10 minute ride to city proper. Super easy access to Vienna woods trail system, great for dogs. The furnishings are comfortable. The photos are real. The neighbors are pleasant. The neighborhood is adorable. I would highly recommend this property. The owner is a mind reader, he replaced the tv remote that wasn't working without me asking. Natural light and air are abundant. Although doors slam unexpectedly since there is so much cross ventilation. Keep them propped open if you have windows ajar. Privacy is respected at all times as well. What a wonderful experience! 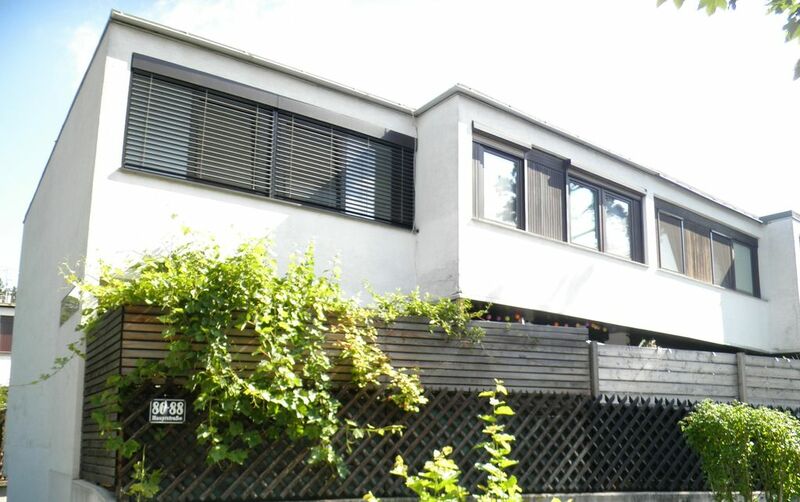 I have already recommended this property to family and friends who want to visit Wien. Was die Größe und die Lage des Ferienhauses anbelangt, gibt es nichts auszusetzen. Das Haus ist schön geräumig und kann eine fünfköpfige Familie sehr gut beherbergen. Zum Haus gehört zwar kein Parkplatz, man findet aber immer problemlos einen in der Nähe. Die Wiener Innenstadt ist mit dem Auto sehr gut zu erreichen. Für den täglichen Bedarf gibt es ausreichen Einkaufsmöglichkeiten in der Nähe. Der Kontakt mit dem Vermieter war jederzeit schnell und problemlos möglich. Kritikpunkte sind anzubringen, was die Sauberkeit und den allgemeinen Zustand des Hauses anbelangt. Die Spüle samt Schwämmchen war schmutzig, Sofa und Kissen waren staubig und die Fensterscheiben hinter den Jalousinen waren ebenfalls nicht sauber. Jalousinengurte waren teilweise abgerissen, die Tür zur Terasse war nicht mehr zu öffnen, so dass wir unsere Sachen am letzten Tag durchs Fenster wieder hereinholen mussten. Der Abfluss im Badezimmerwaschbecken war verstopft und das Wasser floss nur sehr langsam ab. - zeer luidruchtige buurman die de gehele dag en avond de televisie op een zeer luid volume had staan. Wij hebben een goed weekend gehad in dit appartement. Er zijn wel wat kleine verbeterpuntjes mbt de voorzieningen, maar voor een kort weekend verblijf waren die niet storend. Voor mensen met slaapproblemen is van belang om te weten dat de voorkant aan een doorgaande weg ligt en de achterkant richting spoorlijn. OV verbindingen naar centrum Wenen zijn prima, maar 's-avonds laat wel beperkter dan overdag. Dus eerst even goed oriënteren als je laat denkt terug te komen. Casa molto curata e comoda in un quartiere tranquillo e ben collegato a Vienna. Il centro commerciale nelle immediate vicinanze è stato utile. Il proprietario gentile e disponibile. Vienna superlativa. Haben uns sehr wohlgefühlt S-und U-Bahn Anschluss in direkter Nähe. The characteristic of our house is the great location close to the Vienna Woods and the quick connection into the city with plenty of parking without parking costs at our residential complex. We are at the junction of the town to the beautiful Lower Austria with its wine taverns, the hiking trails and cyclists get their costs. The location is ideal for rest with simultaneous cultural offerings of the cultural metropolis of Vienna. We would be pleased to welcoming you. This temporary home is also suitable as temporary residence in Vienna. The house can be referred to as a flexible residence. Our house is located in the west of the city of Vienna and allows living close to nature with a green environment without sacrificing the proximity to the city. In just 15 minutes by car from downtown. The house also offers excellent infrastructure: The bus connection and railway on the doorstep, you can reach the city center in less than 30 minutes. Shops are located across from the hotel about 5 minutes walk (Auhofcenter). Along the adjacent river Wien, there are numerous possibilities for various leisure activities. This cozy house with 120sqm of living space is full mögliert and you can enjoy it alone. The house consists of a 35sqm living room with access to the terrace with garden furniture. It is modern and leaves nothing to be desired. We also offer satellite TV, various books, very nice living-kitchen: with gas stove, sink, refrigerator, coffee filter machine, as well as entrance hall, bathroom, toilet, all centrally heated. Furthermore, there are 3 bedrooms with wardrobes linen and towels are provided and are included in the price. Dogs and pets welcome! Free parking is available for free in front of the house. Languages: English, German. Short term renters welcome but the house is very suitable for business guests as well as Übergangswohung due to the great location and good infrastructure. Vienna has to be seen !! Other Activities: Football, skiing, hiking, cycling. 9 lifts and 19 km runs are available. We also have an apartment am Faakersee with Lake View and Terrace. Airport transfer possible! Price € 50 per trip.